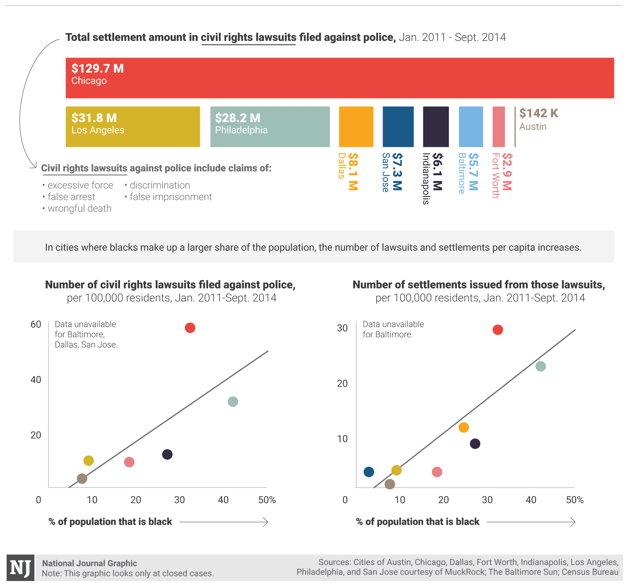 Which Cities Are Sued the Most for Police Brutality? Among a small survey of American cities, it's the communities with the most black residents. With Baltimore still absorbing the charges filed Friday against six police officers in the death of Freddie Gray, other cities may do well to look at their own history in court. The city of Baltimore has paid $5.7 million in settlements from police-brutality cases since 2011, the Baltimore Sun reported last year. And they're not alone. According to multiple open-records requests compiled through MuckRock, a slew of major American cities have paid tens of millions of dollars in brutality suits. One common thread? Cities with larger black populations are far more likely to see suits against the police—and to see eventual judgments. Baltimore has paid millions more in police-misconduct settlements over the last four years than other similarly-sized cities like Fort Worth and Austin, Texas. Notably, 63 percent of Baltimore's population is black, compared with Fort Worth's 19 percent and Austin's 8 percent. Chicago is an outlier, with a disproportionately high number of lawsuits and settlements for the size of its black population (32 percent). This analysis isn't absolute: The documents released through MuckRock don't include every major city, and the sample size is too low to support any scientific conclusion. But amid the turmoil in Baltimore, these numbers give weight to a concern many in these cities already know: Police misconduct is no small problem.